These days the strangest things have WiFi. So when the AppKettle turned up at the Automated Home we wondered if we really needed a Kettle that connected to the Cloud? The UK developed AppKettle is a handsome device with its brushed stainless steel body, a glass water window and an LED display. Setup is a simple process. Just plugin in the base, set the kettle on top and put on the lid. Once you’ve download the free smartphone app (iOS or Android) it will walk you through the usual process of giving your WiFi password which it then in turn passes on to the Kettle to join your wireless LAN. There is no other electric kettle that has double glass water windows within a stainless steel enclosed kettle. It is a hybrid between a stainless kettle and glass kettle. All other stainless kettles have plastic water windows, or no water window. The benefit of glass is to be able to see inside the kettle and not have plastic being heated from the heat plate and touching the water that you are about to drink. The base and app can be set to display the water temperature in either ºC or ºF and the app can display volume in ml or fl oz. The onboard WiFi is 2.4Ghz 802.11 b/g/n flavour with WPA/WPA2 security. Of course Appkettle has manual controls on the base so you don’t need to reach for your phone just to turn it on. Pressing the power “on” button will wake it up from standby and turn on the LED display. It remembers the last temperature you used and a second press will start the water heating to your chosen temperature. There’s a Keep Warm button that allows you to keep the water at your target temp (above 60 degrees) for a customisable period of between 1 and 30 minutes. On the software side you can setup multiple users each with their own preferences. 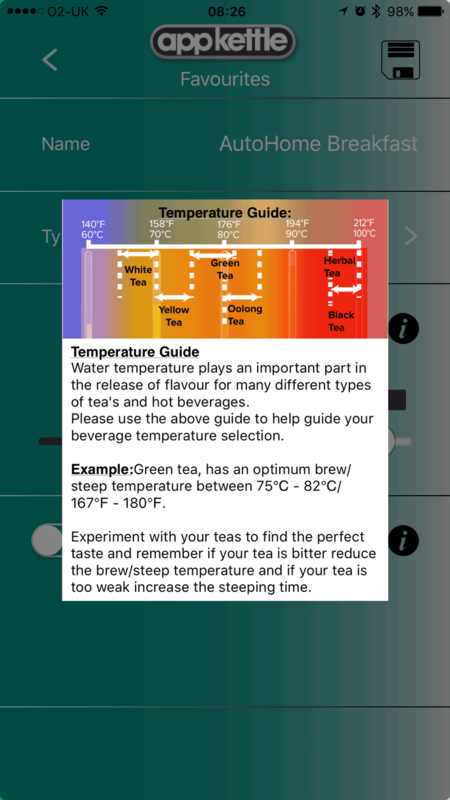 A user can store their own beverage Favourites, these are temperatures for say a Tea vs a Coffee. You can set Schedules to bring your AppKettle on for a cuppa in the morning and set it to repeat on certain days. Usefully the app included a Reminders facility too so you won’t forget to fill it the night before. In addition you can set a Brew Timer with either the Favourites or Schedule feature. This automatically starts a timer once the water reaches the target temperature, allowing you to make the perfect cup of tea (you can also adjust the time between the heating cycle ending and the brew timer starting). Hitting the Social Sharing button sends a customisable message to a friend inviting them for a drink. Check out these AppKettle instructional videos for a good insight into each feature. As AK is Cloud connected and controllable from anywhere remotely, safety is key. So if there’s less than a cup of water (250ml) it won’t let you turn it on. AppKettles impressive volumetric system has a accuracy of +/- 30ml. We have cross-beams linked to a volumetric sensor so that it measures through 360 degree movement. it then stabilises the weight with the kettle and water using an algorithm to monitor when the water has calmed and the weight is constant. Also gone are the days when your over-filled kettle can bubble water out the spout and soak the live base. AppKettle will detect when it has too much water on board and disable the heating element too (max capacity 1.7 litres). The 2.0 – 2.5kW AppKettle has a standby mode that meets the new european energy standard for smart appliances to ensure consumption is below 2W. In addition the ability to set a temperature lower than boiling point means you can save more energy too. Additionally, when you press the ON button, the current temperature of the water in the kettle is displayed, making it easy to decide if you really need to heat it up more or use it as it is. 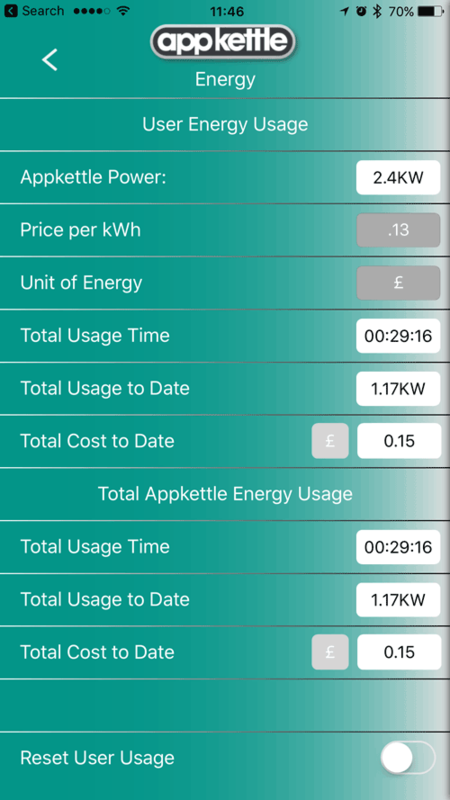 You can see at a glance in the app what energy your AK has used and if you know what you pay per kWh you can add that for a monetary value too. AppKettle is shipping from today for £129 and if you register on the AK website you can extended the warranty for the unit from 1 year to 2. 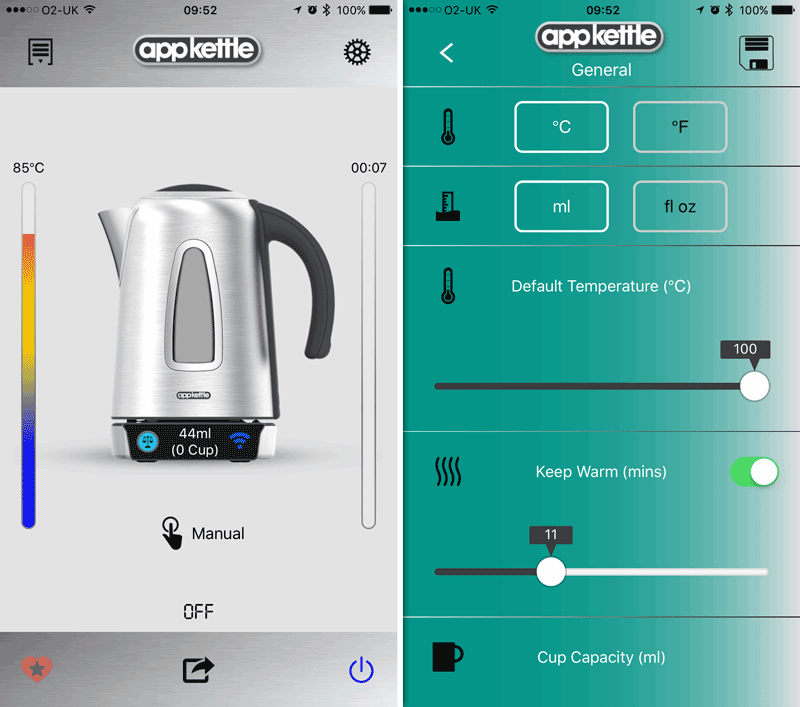 If you’re looking for a reassuringly safe kettle with great build quality plus the smart features and convenience of an app, then AppKettle may be just what you’re after. 8 Comments on "Review: Appkettle – The World’s Smartest Kettle Connects to the Cloud via Wi-Fi"
I have the Appkettle on order (shipping today). Currently I use a LightwaveRF mains socket that I set a timer to switch on in the mornings. This is dependant on me remembering to ‘set’ the kettle the night before. No more getting into bed only to get up again to check there is enough water in the kettle and it is set. Not sure that hubby will appreciate ‘big brother’ when I text him on my way home to fill the kettle! Thanks for the review,looks really nice so I have ordered one, I was thinking of the ikettle but the Appkettle looks so much better. I don’t see the appeal of connected kettles. Surely you still have to fill it with water to get it to boil anyway? Also, what’s the big deal about drinking from plastic? I love the sound of this. Meanwhile I’m part of the way there with a £4 timer switch on my standard kettle. The roaring of the kettle in the morning acts as an alarm call and tells me tea is under way. It is so much nicer to lie in bed rather than hang around in the kitchen waiting for the water to boil. Just received my Appkettle, it took a few go’s to get the kettle to connect to my wifi but once done the app works really well and the apps animation looks great and brings a smile to your face. Build quality is also very good and looks like an expensive item. My son who is not a fan of most of my home automation things absolutely loves this and put the app on his android phone and is looking forward to turning it on from the comfort of his bed. Great item for the gadget lover. I’m actually really excited that more of these types of devices are coming online. In the past you had to rig them with a smart plug or rewire the internals to get it to work. Coffee makers are also coming along although I haven’t found one that does exactly what I want. Maybe sometime soon? Looks good, was this the same Kettle that was a huge story and took a guy like 12 hours to make a cup of tea 😀 😀 still on the way to create a fully automated home. !